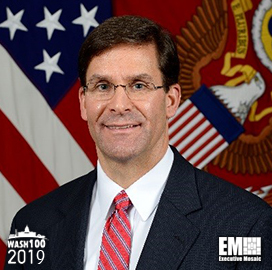 Executive Mosaic is pleased to introduce Mark Esper, secretary for the U.S. Army, as an inductee into the 2019 edition of the Wash100 — Executive Mosaic’s annual selection of the most influential voices in the government contracting arena — for his efforts to modernize the Army’s technology and his ability to prioritize specific projects while maintaining high standards. This latest honor marks his second Wash100 win. Esper revealed that the Army began evaluating programs to be eliminated in order to fund one of the service’s top modernization priorities in April 2018. Among the 800 acquisition programs the Army reviewed, the service prioritized air, missile defense, artillery, networks, soldiers, armor and aviation. Esper co-wrote a vision statement called the Army Vision with Gen. Mark Milley, the Army’s chief of staff and a fellow 2019 Wash100 winner, detailing how the service intends to modernize over the next decade, including plans to compete against Russia, China and others. The document advocates the use of weapons, aircraft, sustainment systems, manned and unmanned combat vehicles and other technology systems to compete against potential adversaries across all domains. The branch also seeks to prioritize training efforts among military personnel through simulation systems, synthetic training environments and acquisition reforms. “This modernization includes experimenting with and developing autonomous systems, artificial intelligence and robotics to make our soldiers more effective and our units less logistically dependent,” according to the statement Esper and Milley wrote. Esper revealed he was open to allowing foreign companies to participate in the evelopment of the next-generation combat vehicle for the Army. He believes time to develop the NGCV is limited, and he is looking to expedite the process. Based on the 2019 Army budget documents, the service branch wants to develop a prototype vehicle by early 2021. Esper was confirmed as the 23rd secretary of the U.S. Army in November 2017. He was vice president of government relations for Raytheon for seven years prior to his appointment. He served as executive vice president for the U.S Chamber of Commerce’s Global Intellectual Property Center and as vice president for Europe and Eurasian Affairs between 2008 and 2010. He also served as the chief operating officer and executive vice president of defense and international affairs for the Aerospace Industries Association. Esper holds a master’s degree in public administration from the John F. Kennedy School of Government at Harvard University and a doctorate in public policy from George Washington University. He received the Department of Defense Medal for Distinguished Public Service, the Legion of Merit, Bronze Star Medal and the Kuwait Liberation Medal. Executive Mosaic congratulates Mark Esper for receiving this award.